I am on such a cupcake kick. It's like all I can think about are those little cakes filled with something dreamy and topped with a creamy frosting. I've now got a list about a dozen long of recipes that I want to try. I even went out and bought a ton of cupcake wrappers (super cheap) the day after Valentine's. So now, all that's left to do is make them and you can bet that's what I'm going to do. After making chocolate cupcakes, I decided that lemon would be a nice change. After searching through countless blogs, I finally hit upon a recipe that looked lemony enough to satisfy me on the blog, Une Gamine dans la Cuisine. Let me tell you, that recipe did not disappoint. I was delighted to find such a delicious recipe on the first try. The cake had a nice crumb to it, was super moist, soft and spongy, and packed with a lemony flavor that makes your tastebuds sing (or zing). To finish them off, I decided to pattern them after the Lemon Raspberry Cookie Cups I made last year. 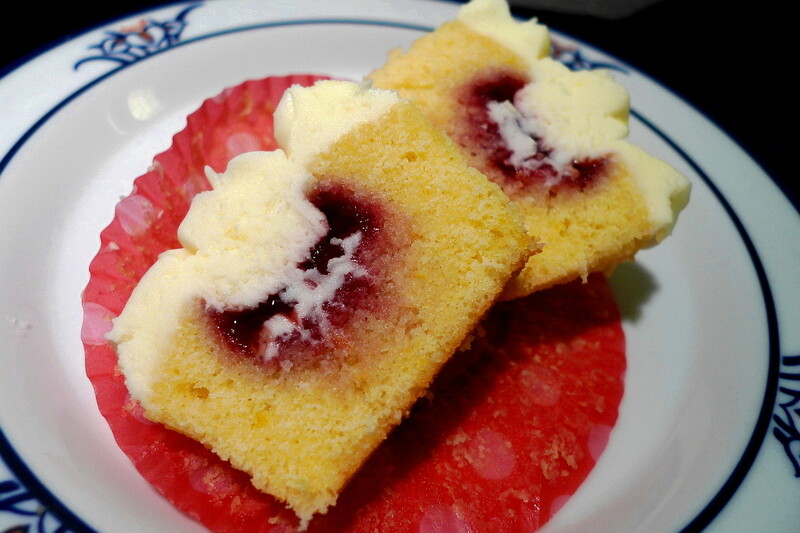 The middles are filled with a dollop of raspberry jam, are topped off with lemon cream cheese frosting, and are then piped with more frosting (cause you can always use more). The combo is simply delightful and perfect for spring. What cupcake will I make next? Stay tuned . . .
Preheat the oven to 350F. Line muffin tins with 12 paper liners. 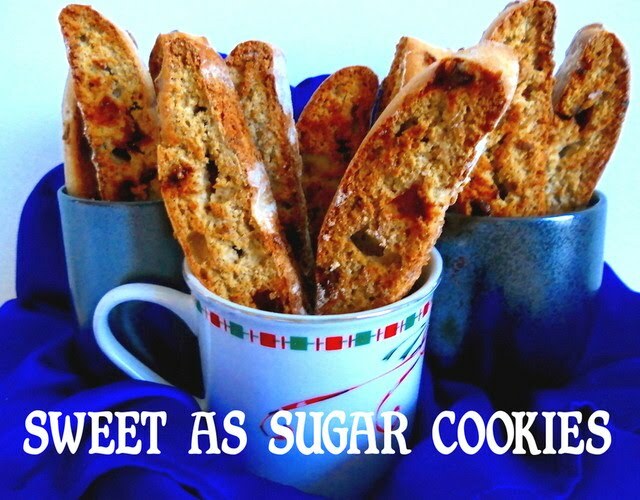 Rub the lemon zest into the sugar with your fingertips until it is moist and fragrant. Beat with the butter until light and fluffy. Add the eggs, one at a time, beating for about 1 minute per egg. Add the vanilla extract and lemon juice. Add 1 cup of the flour mixture and mix to combine. Add the buttermilk and stir well. Add the remaining flour mixture and mix to combine. Divide the batter evenly among the muffin cups. Bake for 20-25 min. or until a toothpick comes out clean. Remove from oven and let cool completely before filling and frosting. For the cream cheese frosting: Beat the butter and cream cheese until smooth. Beat in the powdered sugar until light and fluffy. Add the lemon zest and lemon juice. For the assembly: Cut a small cone out of the top of each cupcake. Fill each space halfway with raspberry jam. 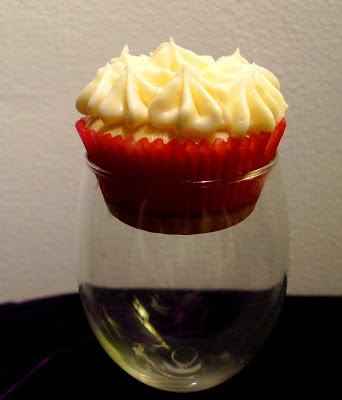 Pipe the cream cheese frosting into the cupcake to fill the rest of the space. Continue frosting as desired. Doesn't the word "ganache" just make you swoon? It evokes an image of something deep, dark, rich, and utterly indulgent. There's something so "ultimate" about it and you feel so luxurious eating it, whether it's in truffle form, topping a cake, or on a spoon in your hand. Ahh, if only things like "calories" and "pounds" didn't exist. Still, if there's one day of the year in which it's okay to go chocolate-crazy, I'd say it's Valentine's Day. 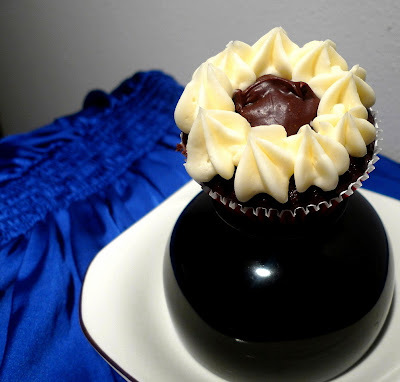 Which makes these ganache stuffed cupcakes the perfect dessert. I used my go-to Chocolate Cupcake recipe as the starting point. And, I made not one, but two dozen of them. No, it's not because I love them so much, though I certainly do. It's because I messed up on batch #1. In copying down the recipe, I mistakenly wrote baking powder instead of baking soda. Then, I found out that the two are NOT interchangeable. The cupcakes made with baking powder did not rise and were totally gummy. 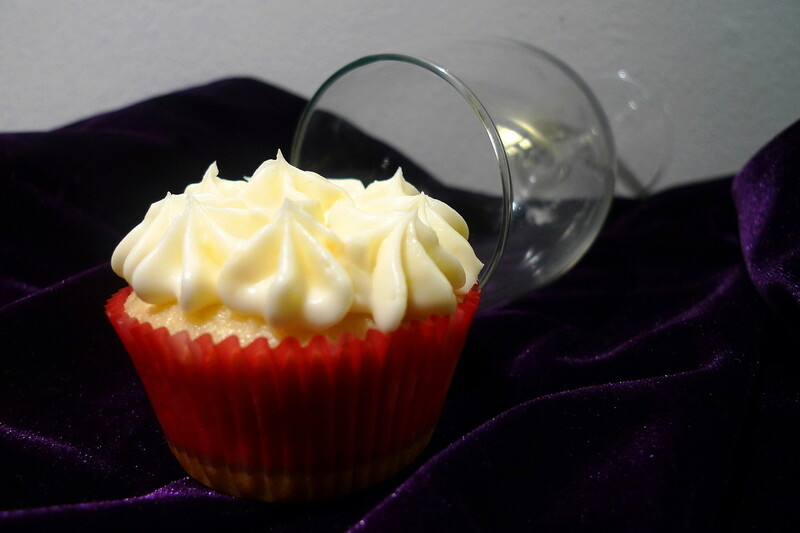 The cupcakes made with baking soda rose up high, were soft and fluffy and everything a cupcake should be. Lesson learned. 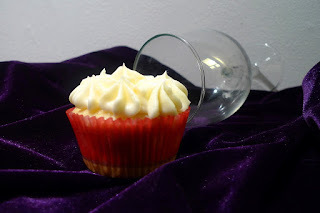 Once I had my good batch of cupcakes, I whipped up some super fudgy, creamy, mint chocolate ganache to fill them and then made some mint buttercream frosting to pipe on top. Once again, I opted to let the filling show and just piped the frosting around it. 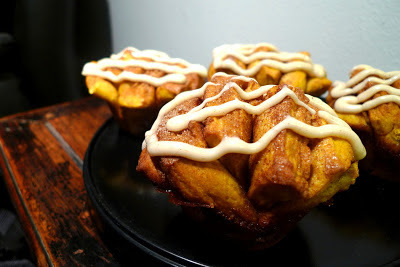 As much as I loved the caramel cupcakes I posted earlier this week, I gotta say that these really take the cake! I guess I'm just a chocolate girl at heart after all. So, go ahead, give yourself a little chocolate love, and indulge this Valentine's Day. You're worth it! For the cupcakes: Line a muffin tin with 12 liners. Combine the melted butter with the sugars. Beat in the egg and vanilla. Mix in the cocoa powder, baking soda, and salt. Add 1/2 cup of the flour and beat well to combine. Add in 1/2 cup of hot water and mix well. Add in the rest of the flour, then the rest of the hot water and mix well. Fill each cupcake liner about 2/3 full with the batter. Bake at 350F for 20 min. or until a toothpick comes out clean. Let cool on a wire rack for 10 min. For the ganache: Place the chocolate chips and heavy cream in a small microwafe safe bowl and heat for 1 minute at 50% power. Stir. Repeat the process until the mixture is smooth. Stir in the peppermint extract and powdered sugar, whisking till smooth. Let the mixture cool to room temperature and then fill your cupcakes. For the frosting: Beat the butter with the powdered sugar until soft and fluffy. Stir in the mint extract. Add the cream until the frosting is at your desired consistency. To assemble the cupcakes: Cut out a small cone from the middle of each cupcake. Fill with the ganache. Pipe the cupcakes with the mint frosting. Caramel. It's like my Everest. I've always wanted to try making it, but was so intimidated by it that I couldn't bring myself to do it. First, there's the hot molten sugar to deal with. Hmm, I don't like the sound of anything "molten." Then, you're supposed to add cream and I've heard that, once you do, the whole mixture starts spitting and spattering angrily at you. Well, that can't be good. Not to mention all that talk of the sugar mixture "seizing". What's a girl to do? There's only one thing to do - face that fear and laugh, or something like that. At any rate, I was tired of staring longingly at the pictures of these Caramel Cupcakes on the blog "In the Pink and Green." I wanted to make them and to do that, I was going to have to make some caramel once and for all. If any of you are like me and fear caramel, then this is the recipe for you. It is super easy and foolproof. You just need to melt some sugar, add a little butter, and then pour in the cream. I used canned table cream, which is thicker than heavy cream, so it hardly spit and spattered at all. And, there was no seizing either. I will admit that I had some crystallization going on (my fault), which led to having some hard bits of toffee mixed in with the caramel. 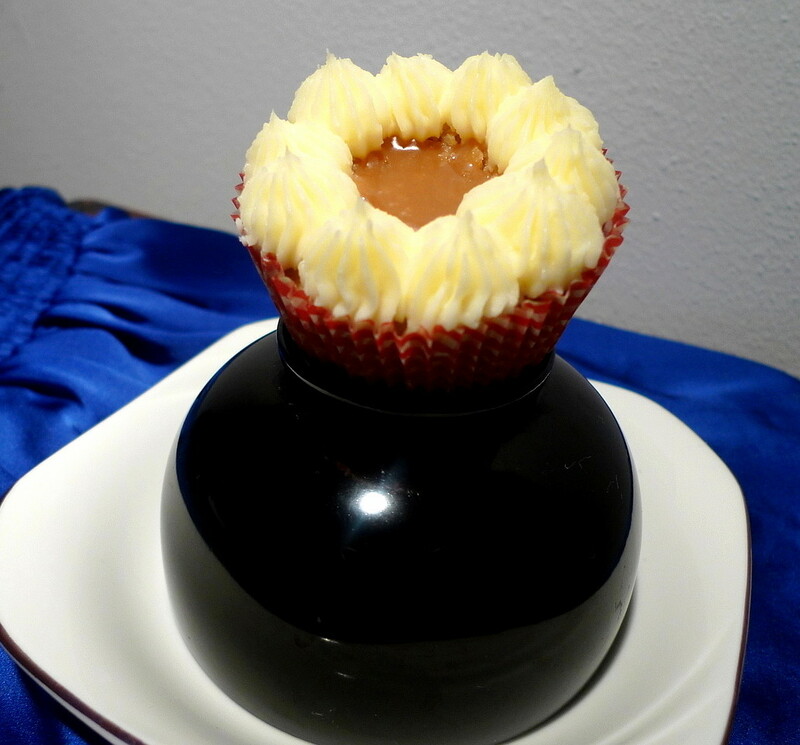 Although I wanted the caramel sauce to be what we call in Hawaii - Broke da Mouth (which means that something is "very delicious"), I didn't want it to literally break someone's mouth, so I just poured the caramel sauce into a sieve and took those bits out (then ate them myself). Luscious, simply luscious. 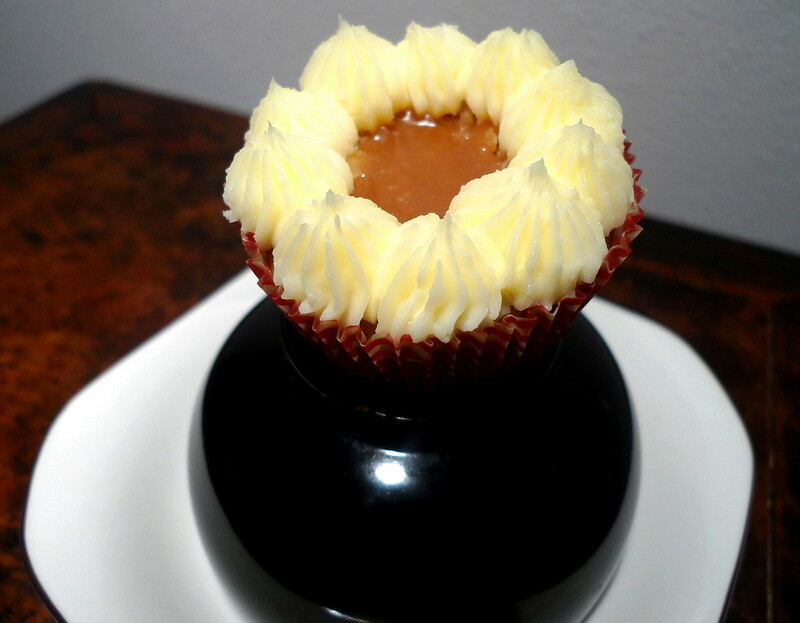 Spoon a little of that caramel into these Brown Sugar Cupcakes and you're ready to swoon with delight. I finished the cupcakes off with some cream cheese icing. But, rather than frost the whole cupcake, I thought, why hide the surprise in the middle? So, I piped a little of the frosting in a ring around the filled center and left it at that. It was so pretty, the cupcakes looked like flowers. Plus, one look at that caramelly center and you know right then and there that you're in for something good. So, now that I've got my fear out of the way, I'm definitely dying to make more caramel and soon. It was awesome! Combine flour, baking powder, and salt. Cream butter and sugar until pale and fluffy. Add eggs, one at a time, beating after each until fully incorporated. Mix in vanilla. Add flour mixture to wet ingredients in 3 batches, alternating with half of the buttermilk, stirring after each until everything is combined. Fill each cupcake liner 3/4 full with batter. Bake 20-25 min. until a toothpick comes out clean. For the caramel filling: Cook the sugar in a saucepan over medium heat, whisking as it melts. When it turns a deep amber color, add the butter and stir until it is melted. Add the heavy cream and whisk until the caramel is smooth. Remove from heat and let it cool. For the cream cheese frosting: Beat the cream cheese with the butter until well combined. Beat in the powdered sugar until soft and fluffy. To assemble the cupcakes: Using a pastry tip, cut a small round piece out of the top of each cupcake. 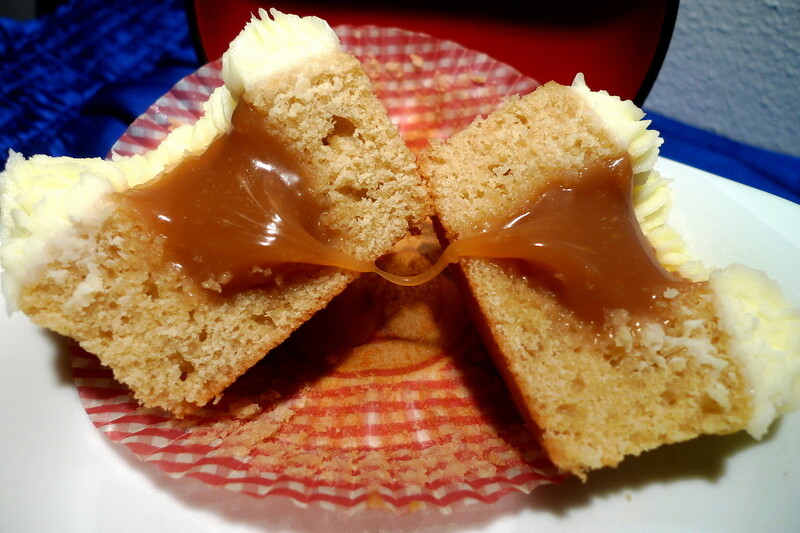 Fill each cupcake with the caramel. Pipe with the cream cheese frosting. I'm a longtime follower of Barbara's blog, Barbara Bakes, so it was one sweet surprise to be assigned to her for this month's Secret Recipe Club. I gave a lot of thought to what I'd choose from her blog, starting out with about a dozen recipes, then halving the list to six, then three. It came down to the Pumpkin Fantail Cinnamon Rolls, the Chocolate Fudge Butterfinger Cookies, and her lovely Snickerdoodle Bread. Though it was hard to choose, I decided on the Pumpkin Fantail Cinnamon Rolls. 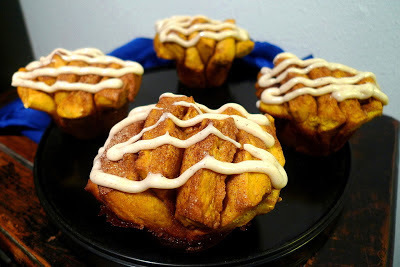 After all, I love baking yeast breads, I love pumpkin, and there is nothing more decadent than a cinnamon roll. Plus, I just had to try that gorgeous fantail look. If you've ever made pull-apart bread before, these will be a snap to make. The only difference is that you put the pieces into muffin cups so, instead of one big loaf, you have a little mini one that can fit in the palm of your hand. So fun! I did make a couple changes to the recipe by adding some spices to the dough as well as using brown sugar instead of white. I also used water instead of milk, but that was because I didn't have any milk in the house at the time. Still, the rolls came out fantastic. They were soft, they were fluffy, they were deliciously caramelized on the outside. Then, as the icing on the cake, or the bread, I should say, you top them off with a sweet cream cheese icing. 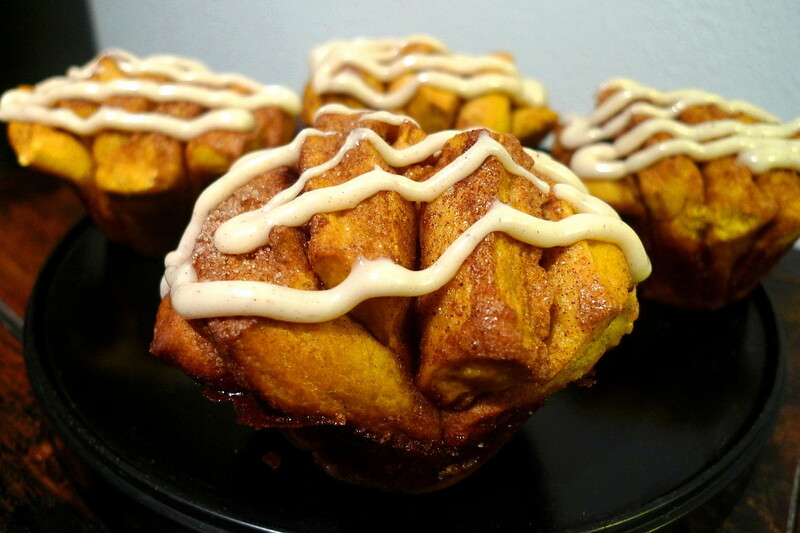 Finally, with a roll in your hand (or maybe one in each hand), you pull off one cinnamony-sugary piece after another and put it into your mouth, savoring every bite. Although they do take some time and effort to make, they are so worth it. Mmmm, irresistible! Thanks Barbara for one super recipe! Combine the yeast with the warm milk and a pinch of sugar and let sit until foamy, about 5 min. Stir in the sugar, melted butter, pumpkin puree, vanilla, salt, spices, and the egg and mix to combine. Mix in the all-purpose flour. Add in the bread flour, 1/2 cup at a time, and mix until the dough no longer sticks to the bottom of the bowl. Turn out onto a floured surface and knead until the dough is smooth and elastic, about 5 min. Put the dough into a greased bowl, cover with plastic wrap and a dishwtowel, and let sit in a warm place until doubled in size, about 1 hour (I put mine into the fridge to rise for about 4 hours). While the dough is rising, make the cinnamon-sugar filling. Grease 12 muffin cups with butter. After the dough has risen, punch it down. Divide it in half and roll into a 12" square. Spread half the butter evenly over the dough, then sprinkle with half the cinnamon-sugar filling. Press the cinnamon-sugar into the butter. For the icing: In a mixing bowl, beat cream cheese until smooth. Add the pumpkin pie spice and beat until incorporated. Add powdered sugar and beat until smooth. Add the milk slowly, a little at a time until the icing is the desired consistency.